When we lived in California, Maggie & Bjørn had a good buddy named Joey who was right between them in age. The three would often have playdates together where they would play a game Joey had invented that resembled a cross between Dungeons & Dragons and a Pokemon quest. Since moving back to New York, my two have shared the "Imagination" game with all their new friends to great success. Today, Maggie asked if we could make this delicious snack that they used to have at Joey’s house. It’s incredibly easy to make & the kids are mad for it. We call them "Bananas a la Joey". Just melt chocolate at a low temp in a heavy bottomed pan or use a double boiler if you have one (we don’t). I used a bag of Ghirardelli’s and added a bit of milk to help keep it smooth as it melted. Cut your bananas in half and insert a popsicle stick in the center. 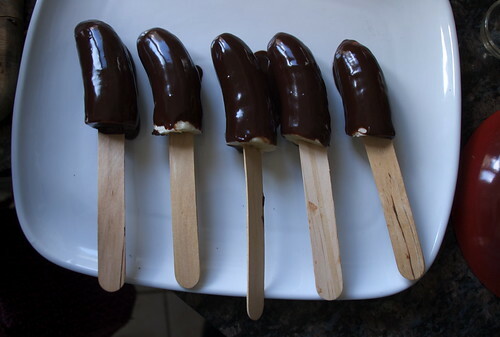 Dip in melted chocolate, and coat completely. Lay out on a platter & put in the freezer for about half an hour. 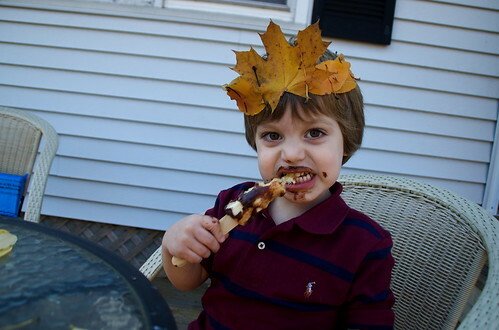 CONFESSION: we only held out ten minutes before caving and gobbling ours up. SECOND CONFESSION: Tomas, we tried to save one for you, but discovered a chocolate covered imp helped himself when we weren’t looking.